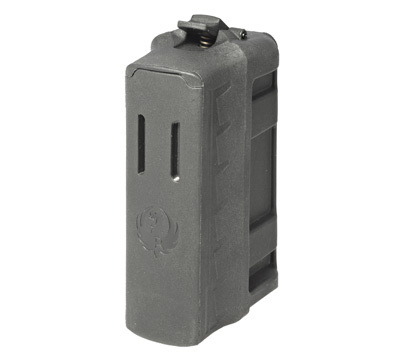 3 round single feed magazine for the Ruger American Rifle® in .450 Bushmaster. Magazine fits securely in the stock with a sleek profile. 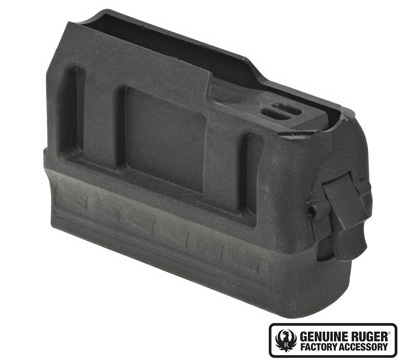 This magazine fits stocks equipped with a removable short action magazine well assembly. *Due to changes in the law effective October 1, 2013 Ruger is not able to sell magazines to CONNECTICUT residents. Bought new American 450 Bushmaster. The magazine floorplate falls out with your ammo if the palm of your hand moves against it backward about 1/4 inch. Either defective manufacture or poor design. I read the reviews from the others. I went out and bought this magazine and there right this magazine works great in my Ruger American 22-250 Rem, 243 Win, 6.5 Creedmoor, 7mm08 Rem, and, 308 win. And i wish that Ruger would ship theses magazines with there rifles instead of the rotary style magazine. Purchased for 22-250 after two different rotary mags wouldnt feed reliably. This 450 bushmaster mag works great with the 22-250. Ruger should drop the rotary mag and start shipping these! After going through several rotorary magazines for the prediator 6.5 creedmoor I learned of others using this 450 Bushmaster magazine as a replacement. It fits in the stock and feeds better than the stock rotorary mag. Will buy another one for back up. works great in American 308, fits 3 nicely but will fit a tight 4, way better than the crappy rotary box that ships with 308 American! if Ruger would start making these out of metal they would rate 5 stars! Works great for my .308. If you have been having consistent problems with your rotary .308 magazine feeding properly in the Ruger American, this 450 bushmaster magazine fits and feeds flawlessly the .308 Ruger American rifles. It holds 3 rounds of .308 and is built much more sturdily than the flimsy rotary mags. Fits well and loads easy, wish it came in 5 shot.